Collect data to find out more about your photography. Is there a better alternative to Aperture Inspector? Is Aperture Inspector really the best app in Image Editing category? Will Aperture Inspector work good on macOS 10.13.4? 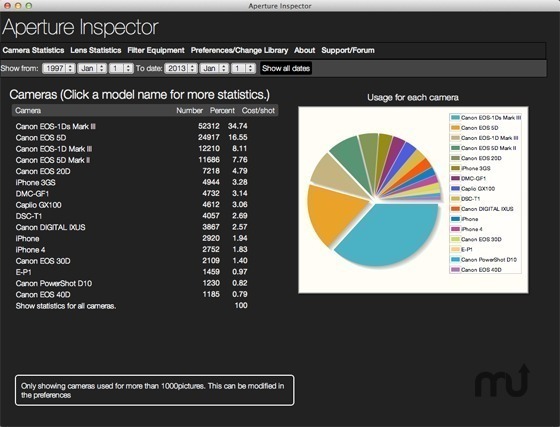 Aperture Inspector lets you examine your Aperture Library to see the cameras, lenses, and settings you use the most. Examine which lenses you use, which ISO you shoot at, and how many images you've taken over time. Whether you're just curious about the way you shoot or are looking to get a deep understanding of your shooting habits and camera use, Aperture Inspector can help. An extremely powerful program, yet it's simple to use. Launch it, drop your Library onto it, and start examining your data. The app is fully functional, but limits the analysis to the last 6 months when it is not registered.